Cold climate gardeners can boast few crops that prefer their freezing winter abode but the sturdy horseradish not only prefers it that way, it requires that cold. It does need a long enough growing season to grow healthy leaves and good roots, but this is one plant that doesn’t need to be coddled through those unexpected frosts. It may not be a main eating crop, but it can enhance many less wild fare. I started growing horseradish in our first few years of gardening. Having read that it was good to plant with the potatoes to keep potato beetles at bay, I carefully put roots at each end of the potato plot. As I was also diligently rotating all my crops in those days, following the expert advise I’d read, the venerable horseradish followed our potatoes through the garden. As I gained more confidence in my gardening skills I began to depend more on my own thinking and observation than the book lore. And it was soon obvious that the horseradish/potato team was one of those "better in theory than practice" recommendations. Not that they didn’t do well together, but the horseradish left a trail of persistent offspring behind while the potato bugs were content to follow the potatoes wherever they went, with or without the horseradish. GROWING -- Though horseradish will grow in such conditions, it grows better roots for harvesting if given its own space and attention. It favors rich, deep loam and will not thrive on overly sandy or dry, gravely soil. And being a deep root crop, it needs depth to grow, so a hard subsoil won’t be to its liking either. But in the wide area between the extremes, which is pretty much any healthy garden soil, it will give you a good crop with little fuss. Give it a spot of its own where its spreading habit can be contained. It’s a large leafed, tall perennial plant so make sure it won’t be overpowering a more delicate neighbor. Though horseradish flowers, it seldom sets viable seed so propagation is by root or crown divisions planted in early spring or in the fall. It doesn’t take much of a root piece to get the horseradish growing, which is why it is so hard to eradicate once established, but you’ll get a better plant (and root) with a good sized start of root or crown. Plant the crowns as they were growing originally, with the top level with the top of the soil, and the roots horizontally several inches deep in the soil, 12 to 18 inches apart in the bed. Mulch it well and let it grow, adding more mulch later as needed. 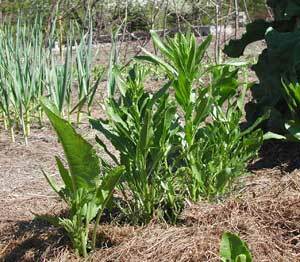 As with most crops, if you have decent soil and a good mulch, you won’t need to artificially water the plants. They can handle the wet years and the dry years, the cold and the hot. The plants grow and the roots enlarge and thicken as the season progresses, working toward those tanned skinned, white fleshed, fairly firm roots that have such a firey reputation to, as the 1937 Taylor’s Encyclopedia of Gardening says, "tickle the jaded appetites of the overfed". Or simply to add some welcome spice to the homestead meal. DIGGING -- Horseradish roots can be dug any time the ground isn’t frozen. But as with most root crops, it is at its best in the fall, and even better after cold weather has arrived but before the ground freezes. This is generally when the bulk of the roots are harvested. You can harvest the first fall after planting, but it might be better to let it grow another year to let it get established. The plant grows a large, long taproot with many branches and long side shoots. If you are going to grate the root by hand, you’ll want only the sturdy main root. But if you are going to chop or use a blender, then you can also make use of the larger of the side shoots. When ready to harvest in late fall, I rake off the mulch, roughly dig up the main plants with a garden fork, and take the often branched main root and a number of the long slender shoots. There are many shoots and roots left throughout and I rake the dirt back and let it go at that. Of course, there goes the nice and neat spacing, as next spring the plants will now grow here and there as they will. But it works and is an easy way to manage the plot. However, you can be more diligent in harvesting roots, pulling all you can find, then replanting 6 or 8 inch lengths of pencil or small finger size roots, or divisions of the crown of the main root as you did originally. 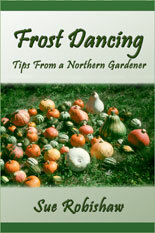 There will still be many missed roots putting up small shoots, but the main plants will be as you planned and planted. This will probably give you a better crop. You can also just dig up roots as you need them. If you have a thick mulch, or deep early snow, the harvesting period can be extended until the depth of winter. Roots can also be dug in late winter/early spring when the ground thaws. But the plant starts growing early so this harvest window is usually fairly small. Once growth has started, its best not to disturb the plant so it can put all its energy into producing good roots for fall, and not have to spend time repairing damage done by mid-season harvesting. 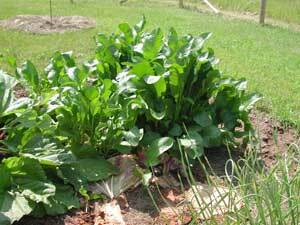 ROOT STORAGE -- If you want a continuous supply of horseradish sauce and you live in the far north, you’ll need to store roots for making fresh sauce throughout the winter and spring. If well stored, roots can probably be saved and used on through the summer, but so far I haven’t had enough roots left to try that. Besides, for us, horseradish sauce isn’t as much desired in the summer as winter. Roots can be stored neatly in slightly damp sand or leaves in a cold (but not freezing) cellar or space over winter. Or, as I do, put a layer of leaves or mulch in the bottom of a plastic bucket, put in as many freshly dug roots as will fit, cover with more leaves or an old towel. This works, too. Use the smaller and damaged roots first, as the better and larger roots will store longer. You could also dig a trench in the garden to store the roots with other root crops such as potatoes and carrots. Buried and covered with a thick mulch, they can be harvested until the snow gets too deep or the ground freezes. In early spring, these roots will be much fresher and in better shape than cellar stored ones. You run a risk of unexpected deep freeze or rodent damage, but the quality is worth the chance if you have enough roots. SAUCE -- Our sauce experience is rather mild compared with true horseradish affectionadoes, though we’re quickly becoming heavy users. I barely remember the first sauce I made from a few roots grown in our first back-yard city garden almost 30 years ago. But I DO distinctly remember the result when I took the lid off the blender for the first time -- GASP, GASP!! Great stuff for clearing the sinuses--instantly, and cheaply. Highly recommended. After we moved to our northwoods homestead, and having grown the stuff for several years, I decided I really needed to do something with it. At that time, I felt I had to can or preserve in some fashion everything I grew or could harvest. But the only thing I knew to do with horseradish sauce was as a condiment with meat. And, living without refrigeration for the first time, we were well on our way to a non-meat diet. I did harvest some roots though and decided to give it a try. But the horseradish was growing well, and I wanted to use it, so I figured I’d have to can it. Not knowing quite how to do that, I wrote to the one source I thought might be able to help -- Countryside magazine. How, I inquired, does one can horseradish sauce?, hoping they (not knowing who "they" were at that time) might print a reply in a future issue. To my great surprise, I received a hand-written note back from the editor (also publisher, manager, writer, man-of-many-talents), JD Belanger. One doesn’t CAN horseradish sauce, he (I assume with some restraint) kindly explained, it would ruin the flavor. He said he regularly made quarts of sauce, simply keeping it in the refrigerator, and eating it with breakfast eggs every morning. QUARTS?! Wow. Some 25 years later, I’m still awed by receiving a hand written note (the first of many) from a VERY busy man, and by his QUARTS of horseradish sauce. Thankfully, my relationship with Countryside continued on with a steadier course than my relationship with horseradish sauce. Even when I moved my horseradish from field to garden, I didn’t seriously consider making sauce. It was as much for having good roots to give away that it made its way back into my life. A good friend, gardener and amateur chef, Peter Copenhaver, mentioned wanting to get some horseradish growing on his and Melissa’s new place. So the first harvest from the prolific new plot was a bucket of roots and crowns for him to plant and make sauce. Later he kindly gave us several half-pints of his prepared sauce in return. So of course we had to at least try it. But with what? No meat to eat it with, and since our years of raising chickens was long past, we seldom ate eggs. A common supper for us in fall and winter is potatoes (baked if the heating stove is going) with various vegetables -- whatever is in season or in storage -- sauted and steamed with onions and garlic. That’s what was on the table, so that’s what we tried Peter’s horseradish sauce with. Wow! It was delicious, and a great side for the potato dish. We were hooked. Those two pints went fast. It was too late in the winter then to dig roots, but the following fall I harvested a good crop for both Peter and myself. We were now hooked on making and eating our own horseradish sauce. But this time, there was no problem with how to store it. We eat it too fast for one thing, but I also found the sauce keeps just fine for many months in our cool root cellar. Although I knew I could grate the roots with the grater, it is a slow process. So our next trip to the St Vincent de Paul store gained us a small, used blender. Our solar array was much larger now than our early one panel system, and we could afford the electricity. Although still not fond of kitchen gizmos that take up too much space and time, I do like the blender for making horseradish sauce. And although we did the job outside in the woodshed that time, which was pleasant, we've since made it in inside the house. Either our roots aren't as pungent as those first ones we had, or we have become more tolerant. 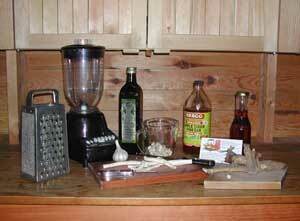 If using a blender, add small quantities of root at a time with as much vinegar as needed to keep it working. Add other ingredients and blend to your liking, adding vinegar for a good consistency. If using a grater, grate the roots, mince the garlic, and mix all the ingredients together. Put in clean jars. Makes 3 to 5 half pints. Last year I had a mostly empty jar of yellow mustard on hand, so I "rinsed" the jar with cider vinegar and used that in the horseradish sauce. Nice! A bit of extra flavor and a beautiful pale yellow color (which doesn't really fit the bite of the horseradish sauce, but I like how it looks). So I've added mustard to my recipe. Be prepared, the fresh sauce is usually pretty potent, depending on the time of year and age of your roots. Some like it freshly hot; while I like it better after the sauce has mellowed for a month. Either way, it’s a great accompaniment for a variety of meals, whether plain or fancy, hot or cold. It’s also an effective healing herb for congestion, coughs, bronchitis and sinus problems. It's a great addition to the cold climate garden. 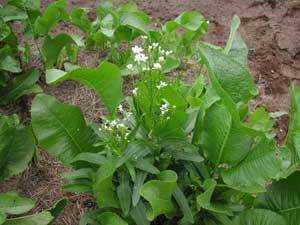 As you've no doubt noticed, horseradish can be quite a persistent weed! It's hard to clean out of a garden but I found that by continually weeding and pulling the roots out it does wear down after several years. Meantime, it's good eating. I don't cut the flowers off and I have good harvests. Besides, many pollinators appreciate the flowers and it's a small matter to leave them for these hard working and wonderful creatures. It's also usually said that one should keep rhubarb flowerstalks cut and I wondered about that. So one year I didn't. The bees LOVED the flowers and they were pretty and I still had a great rhubarb harvest, as usual. So now I leave the flower stalks for the pollinators until the blooms fade, then cut them off.